As you plan your analytics and data architecture on AWS, you may get confused between Redshift and Aurora. Both are advertised to be scalable and performant. Both are supposedly better than incumbents. Both have optically inspired names. So, what’s the difference? In short, Redshift is OLAP whereas Aurora is OLTP. In this blog post, we’ll help clear up the confusion between OLTP and OLAP so that you can make the right choice between Aurora and Redshift. What is the name of the current user, when given an email address? What is the last stage that a player was in for my mobile game? 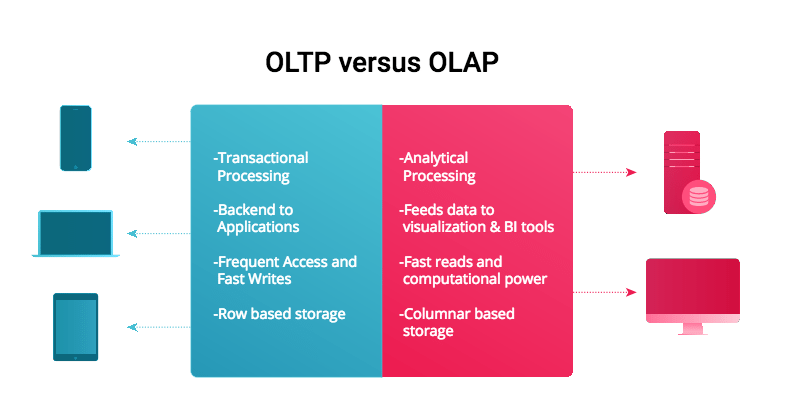 In contrast to an OLTP database, an OLAP database is designed to process large datasets quickly to answer questions about data. The name reflects this purpose: Online Analytic Processing. 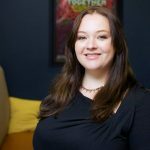 What’s the customer lifetime value of my e-commerce application? What’s the median duration of play time for my mobile game? What’s the conversion rate for various landing pages based on the referrer? An OLAP database is optimized for scanning and performing computations across many rows of data for one or multiple columns. To improve performance, OLAP databases are designed to to be columnar. Instead of organizing data as rows, the underlying data in an OLAP database is organized column by column. Columnar based storage allows for better compression and easier sequential reads, features necessary for scanning large amounts of data quickly. An often multi-shard MySQL database with application layer scripting to perform historical event data analysis. Although this setup is extremely common, it is one of the least productive ways to approach analytics. MySQL is not optimized in any way for reading large ranges of data and its support for analytic functions is weak. As there are multiple alternatives, avoid this “inexpensive” solution because you’ll be paying the price in other places eventually. Using PostgreSQL as an OLAP layer. This is a more legitimate choice than above for starting an analytics platform because of Postgres’s solid analytic User Defined Functions (UDFs). Also, thanks to its c-store extension, PostgreSQL can be turned into a columnar database, making it an affordable alternative to commercial OLAPs. Finally, if you are considering moving from OLTPs abused as OLAPs to “real” OLAPs like Redshift, I encourage you to learn how to use Redshift’s COPY Command so that you can start seeing your data inside Redshift.